Tokyo, December 7, 2012 — Ricoh Company, Ltd. (President & CEO: Shiro Kondo, hereinafter "Ricoh") today released the Ricoh Group Sustainability Report 2012. 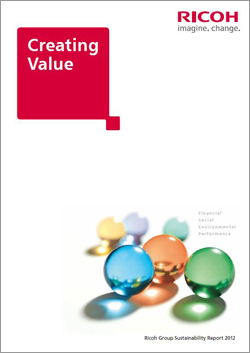 The Ricoh Group Sustainability Report 2012 is a single, integrated report on our business activities from three perspectives, finance, social, and the environment. With this report, Ricoh aims to address its stakeholders' need to have information on corporate social responsibility, such as the environment, governance, corporate citizenship, human rights and diversity, in addition to financial data, so as to appraise the company and acquire an overview of the Group entirely. Guided by The RICOH Way, the foundation of all corporate activities, we are committed to delivering new value to customers and society. In this new report, Ricoh aims to introduce the Group's policies, strategies and the concepts that underpin them to help its stakeholders deepen their understanding of the Group's business. To achieve this objective, Ricoh worked to expand and improve disclosure items, utilizing guidelines such as ISO 26000, an international standard for corporate social responsibility, and the Communication on Progress (COP) policy of the United Nations Global Compact. Ricoh also emphasizes intelligibility, and specialized information that was previously offered in the three separate reports it published on its website. The Ricoh Group Sustainability Report 2012 is available on our website, PDF and digital book format, the latter being the best suited for viewing on tablet devices.